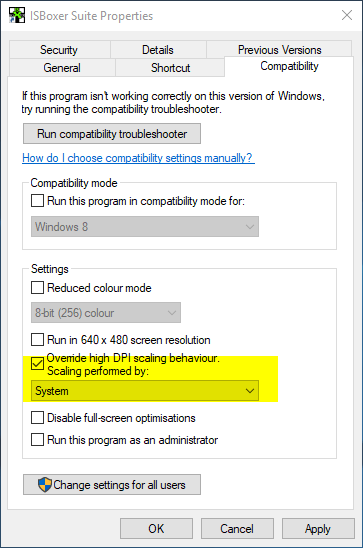 According to that, you have the Windows DPI scaling (Settings in Windows), set to 300%. I'd try settings Windows to 100% (basically, at 300%, everything is pretty much displaying at 1280x720, although the math on what resolution is actually being used is complex). Now if you can't work like that because your 4K monitor is small (i.e. less than 40"), and it makes everything tiny, then, set the ISBoxer Toolkit application compatibility for DPI to be System, and then create a new Window Layout. You also may want to set this option on the diablo exe that is being used. Note: this image is from an older version of Windows 10, so you may have a button on this page to get to another page to then select this setting. If you want to keep the 300% setting, you need to have the toolkit and the games executables (and possibly even launchers), set to System for the DPI override. You would also need to create a NEW window layout (wizards menu, window layout wizard, don't choose something from the dropdown which says it is "existing") after setting this for the toolkit, so it retrieves the correct settings for the displays. That should then allow the games to run at 4k, and windows to rescale for display.